We’d love your help. 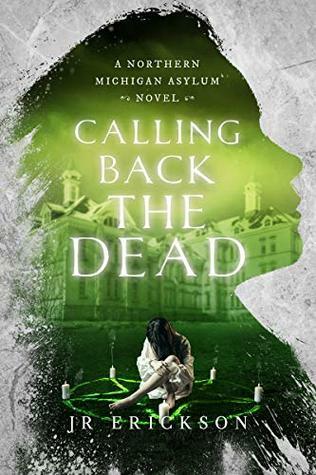 Let us know what’s wrong with this preview of Calling Back the Dead by J.R. Erickson. The sprawling Kerry Manor has stood abandoned for nearly a century. But that hasn’t kept the darkness at bay. Stories about the cursed house trickle out. Violent deaths, strange sightings, and always the chilling sound of a little girl’s song permeates the murky halls. Today, Kerry Manor is restored to its original grandeur. Corrie and Sammy Flynn, and their daughter Isis, move into the house for a winter retreat. As they settle into the dim, gothic rooms, they cannot imagine the terror that awaits them. Kerry Manor houses a malevolence that spans a century. A twisted tale that began when a little girl went into the Northern Michigan Asylum for the Insane and emerged as something dark - something evil. Kerry Manor is the second novel in a series of stand-alone stories in the Northern Michigan Asylum Series. Start your chilling journey today. To ask other readers questions about Calling Back the Dead, please sign up. Another chilling episode in the history of the North Michigan Asylum for the Insane. North Michigan Asylum, a place where evil poses as physicians, and patients are fed to the monsters. How far can their evil roam affecting the lives of nearby residents? Start now and find out! In 1900 a young girl with behavior problems spent some time in the asylum. Ethel walked in a frightened, innocent child. What walked out after treatment was something else entirely. The result was disaster for her family a Another chilling episode in the history of the North Michigan Asylum for the Insane. North Michigan Asylum, a place where evil poses as physicians, and patients are fed to the monsters. How far can their evil roam affecting the lives of nearby residents? Start now and find out! In 1900 a young girl with behavior problems spent some time in the asylum. Ethel walked in a frightened, innocent child. What walked out after treatment was something else entirely. The result was disaster for her family at Kerry Manor. This was the first incident of tragedy there, though far from the last. In 2001 Corrie and Sammy with their two year old, Isis, thought they were in for an exciting new chapter in their lives when they had the chance to rent the newly restored Kerry Manor for eight months. Corrie was taking time off from her therapy work to write a novel. Sammy, a creator of comics loved the old place and the few stories he had heard of it. The highlight of Sammy’s year was his annual Halloween party. He always went crazy with the decorating, and every other aspect of hosting this yearly bash. This year should prove to be the best yet, set as it was in the creepy old house. But Corrie, Sammy and Isis weren’t the only things to live in the manor. The presence there had been waiting, ready to catch the unwary in its web. Will this family escape unscathed? Or will they be devoured, fed to the monster? I thoroughly enjoy this series! Great stories, great characters and really great location!! Being a transplant Michigander in my retirement years I’ve enjoyed Michigan so very much. So much to see and so much to do year long!! I live in the Big Rapids area, but I enjoy the Cherry Festival every year. This year I’m going to be looking for the old Asylum grounds! I’m so excited!! Thank you for writing about our beautiful state. We always welcome visitors!! Not as good as the first in the series. Needed more ghost husband involvements. This books is a great story concerning ghosts and possession. J.R. Erickson has written a suspenseful story that winds through time. Tracing the origins of the troublesome ghost is wonderfully done. I’m JR Erickson, also known as Jacki Riegle in a slightly more tangible reality. I’m the author of the urban fantasy series Born of Shadows, which includes Ula and coming soon Sorciere. Though I love fantasy, I’m not a one-genre kind of girl. My chick lit book Skidmarks on My Heart is in the editing process and I also have some paranormal fiction that I hope to publish in the next several months. L I’m JR Erickson, also known as Jacki Riegle in a slightly more tangible reality. I’m the author of the urban fantasy series Born of Shadows, which includes Ula and coming soon Sorciere. Though I love fantasy, I’m not a one-genre kind of girl. My chick lit book Skidmarks on My Heart is in the editing process and I also have some paranormal fiction that I hope to publish in the next several months.